Add to that the difficulties in communicating the many variables involved, and all the possible simulation options, to everyday users with limited time. And then there are the usual issues with designing friendly software, getting the bugs out, and then delivering it to work reliably on dozens of different hardware/software platforms across the web. So, I’ve often been critical of retirement calculators here. But they are necessary tools, and they helped me develop the confidence to make the leap into my own early retirement. In the years leading up to that retirement, plus the last couple years of blogging, I’ve evaluated 34 different retirement calculators! And, I’ve kept extensive notes on each. For this post I went back through those notes and picked the top half-dozen or so free calculators to re-evaluate in depth. Of those, three made my final cut, as worthy of recommendation to you. And I’ll unveil them shortly, below. But first let’s develop a retirement scenario, and then talk a little about choosing and using retirement calculators…. We start with a couple, age 60, retiring today. Their living expenses are $4,000/month or $48,000/yr. Their portfolio of exactly $1 million is 100% in a traditional, tax-deferred retirement account, and their asset allocation is precisely 50% stocks and 50% bonds. Given today’s economic conditions, we’ll assume a historically low 8% average annual return on the stocks, and a 4% average annual return on the bonds (or a 6% average annual return for the entire portfolio). We’ll use a retirement length or planning horizon of 40 years, taking this couple up to age 100. Because inflation is a serious concern now, we’ll use a historically high inflation rate of 4.0%. And, because our retirement couple are relatively frugal livers, we’ll use an effective tax rate of 8%. Next, let’s talk about my selection criteria for these calculators. I spent my entire career developing software, so I’m both very understanding of the difficulties involved, and very critical of the end results. I’ve worked with thousands of software packages over the years and I know what’s possible from smart, committed programmers using the best tools. So I don’t have much patience for anything less. Obvious bugs, user interface glitches, and performance problems turn me off quickly. I have little tolerance for programming-101 issues like forcing users to enter data in a certain format. When there are obvious issues like these, I wonder what other problems are lurking under the hood…. For starters, I ruled out a number of calculators that were clearly dated. If the user interface looks 10 or 20 years old, can I really trust that the underlying calculations are taking advantage of the latest ideas on how to model retirement? This also led me to rule out a number of spreadsheets that are available for free download, often from generous engineers who preceded me in the personal finance world. There may be some hidden gold there, but given the security issues, rudimentary user interfaces, and hard-to-validate algorithms buried in spreadsheet cells, I can’t really recommend them. Next I looked for both simplicity and internal consistency. I don’t believe the retirement equation has any precise answers. So to collect a pile of detailed data for a complicated analysis spanning 40 years into the future is just silly and pretentious, especially if it leads to a confusing user interface and bugs! It’s so much better to create a simple, understandable model that at least provides some modest insight into one aspect of the retirement equation. But I did consider some type of Monte Carlo or backcast capability to be a plus. Two of the finalists have this, but one doesn’t, by design. Though the validity of those analysis techniques can be debated, they do give you some feel for the probability of various outcomes, instead of just a single answer based on averages. They attempt to simulate some of the risk from market volatility in retirement, because when you retire in relation to market cycles turns out to be a lot more critical to your success than the historical averages. Nevertheless, retirement calculations are one area where cleverness is not a great benefit, in my opinion. I’ve used two of the most heavily-hyped products out there, both supposedly applying sophisticated, proprietary algorithms to optimize your retirement. And in both cases the software was virtually unusable, producing nonsense results for a set of simple inputs. Given more time or information, could I get them to work? Probably. But if they’re that finicky, do I have any faith in their ability to predict the future? Not. I’ll admit, I held the big financial services firms, with teams of programmers on staff, to a higher standard. If they put up a beautiful user interface, and collect lots of data, then they’d better use it well. If they botch my scenario, then I’m going to be less forgiving, and less interested in pursuing a workaround, than I would be with a one-person operation. Finally, since I was only interested in calculators that most of my readers could access, I ruled out paid products, and even those requiring “registration” or “membership” — though that didn’t turn out to be a deciding factor. Believe it or not, the most common and frustrating issue in using most of these retirement calculators is that the vast majority of them can’t handle early retirement! Incredible, but true. Apparently it doesn’t dawn on the designers that people might stop working before reaching Social Security age, or that they might actually be at the point of retirement already. Even a scenario like the one we’re using, which doesn’t look much like early retirement, but does feature a gap until Social Security starts, caused all kinds of headaches. Many calculators actually require that your retirement age be greater than your current age, or force you to input a current salary. They also generally conflate the concept of “retirement” with receiving Social Security, even though, in reality, those two events are totally distinct. They then go on to make dubious assumptions about your Social Security benefits. If you’re in the accumulation stage rather than nearing retirement, then the problems I ran into using the near-retirement scenario may not affect you. Some calculators insist on computing living expenses as a percent of pre-retirement income. For typical consumers working 40-year careers and spending nearly every dollar they make, perhaps that makes sense. But such assumptions generally make the calculation useless for frugal retirees who have lived on only a fraction of their income. Note that very few retirement calculators attempt any sort of detailed tax computation. And that’s for the best, in my opinion. Usually they settle on prompting for a simple “tax rate.” In almost all cases, this means an effective tax rate, not a marginal rate. If you enter your marginal tax rate, you’ll probably grossly overestimate your tax liability. Lastly, note that it’s very rare for retirement calculators to prompt for an investing expense ratio. They may include it in their calculations automatically. In which case it may be much too high — if you’re a low-cost passive index investor. Or they may ignore it altogether — in which case you’d better be a low-cost investor, because otherwise the results will be too optimistic! Before we get to my conclusions, know that there are many retirement calculators. There are bound to be some good ones that I missed. Of those I reviewed, some where impressive — with respected companies or academics behind them. But, for the various reasons outlined above, they didn’t measure up to my criteria. Perhaps it’s not surprising that two of my preferred calculators are from actual retirees, and the other is a lesser-known option from the most retiree-friendly financial services company. As in so many other areas, those who’ve actually done it and actually lived it know the solution best. As I’ve already explained, I prefer a simple model you can play with to understand your best course of action in the near future, to overblown calculators that attempt to collect loads of detailed information about what you’ll be doing decades from now — all of which will change. The calculators below will provide you with relatively quick and transparent answers that you can understand. Pros: Simple yet sophisticated. The colorful interface provides easy access to a powerful simulation under the hood. This is the only one of the three calculators that bases its simulation on historical data points, so it provides a valuable perspective. You could do worse than to begin your retirement planning here, to simply get a feel for how large sums of money behave over long stretches of time. Just remember this is a simulation, not a prediction for what will actually happen to your money over the decades ahead. Cons: You can input asset allocations but not actual returns: so historical values are used. That means, in times like these, that the returns are very possibly overly optimistic. You might try inputting a more conservative allocation than you actually use, to compensate. There is no explicit provision for taxes, so you’ll need to estimate and add them to your expenses, if that is important to you. There is also no provision for Social Security, so I added a rough present value to represent the retirement scenario. Inflation is sampled from historical data, which you cannot override if you believe it will be higher going forward. The historical sampling method for asset classes assumes there is no relationship between returns from one year to the next, which is probably not accurate. Pros: This calculator is based on Todd’s actual experience modeling real world retirement plans with clients. The calculator is designed in sections, but presented on a single screen, so it is simple to change a single variable and recalculate. It’s very easy to use, but actually offers a rich array of inputs covering most of the retirement possibilities. You can set an income glide path, leave an estate value, and control inflation and tax rates. It also allows scheduling a set of post-retirement incomes (including cost of living adjustments) and/or one-time benefits. Finally it generates a nicely formatted report that lets you easily see and verify the results. If you could only use one retirement calculator, this would probably be the one. Cons: As stated, there is no Monte Carlo or historical simulation, so the calculator won’t tell you the probabilities for failure of your scenario. (Understand that is by design: Todd believes probabilistic retirement planning is fundamentally flawed.) So, at a minimum, you should probably reduce the expected average annual return on investment used, to account for volatility in market returns. Also, the validation of inputs could be tighter. It’s possible to get some garbage in the input or output without clear warnings from the program. And, like many others, the calculator requires your retirement age to be greater than your current age. But you can work around this by adding or subtracting a year, without a substantial impact on results. Scenario Results: Ending balance: $2,199,722. Retirement success. Overview: The Flexible Retirement Planner may be the most powerful free retirement calculator on the web. The user interface is rich and well executed, and the modeling capabilities are extensive, without being overwhelming at the start. The model is a Monte Carlo simulation relying on a Gaussian distribution computed using an average-return plus standard deviation. But it can also perform a conventional average-return simulation by setting the standard deviation of returns to zero. Pros: The Flexible Retirement Planner is notable in offering a range of “spending policies.” It can model real-world retiree behavior by adjusting spending in response to major portfolio fluctuations. You can model “conservative” and “flexible” responses, even returning to work if necessary. I don’t know of any other free software that can do this as effectively. It would be nice if the policies could be customized, but to have them at all is impressive. You can also vary portfolio returns, inflation, tax treatment, and cash flows. The program offers several detailed tabular views and can track multiple runs. There are also advanced features like RMD’s and sensitivity analysis. The graphical output is very rich, showing the median portfolio value by year for the three available account types (taxable, tax deferred, and tax free) by default. But you can also overlay several other parameters like the % of expenses funded, failures, and success bands (10%-90%). The program is extremely well documented. In fact, the web site is a small treatise in retirement planning/modeling itself. There is even a support forum available. Cons: The Flexible Retirement Planner requires Java to run, and the site can be sluggish. (Java has seen a spate of security issues in recent years and many people have removed it from their browsers altogether. In general, you only want to enable Java for sites that you trust.) Other complaints are minor: the default returns for various investing styles seem overly optimistic by today’s standards, but are easily customized; there might be a small inconsistency in reporting portfolio values when the current age and retirement age are set the same. Note, the program generally displays values in today’s dollars, even when it is adjusting for inflation. This might be a convenience, or confusing, depending on your point of view, since most other calculators display the inflated amounts. And, of course, your opinion or experience could well be different from mine. Do you have a preferred retirement calculator? Leave a comment about it below with the pros and cons. For extra credit, run the retirement scenario through it, and let us know the results! Thanks for pointing out some great retirement calculators! I prefer FireCalc (http://www.firecalc.com/). Have you tried it? Is there some reason that you think the others are better? Thanks rjack. I’m certainly familiar with FireCalc and even used it when evaluating my own retirement. It’s not currently at the top of my list (my criteria are in the post). But I’m interested if you or anybody else would like to share your views on its pros/cons, or even what it says about the retirement scenario in my post! Very helpful – thanks for this. I’m not sure what constitues ‘early’ retirement anymore, but I hope my wife and I are headed there.. Your site is a good one. Great list and I just twitted it. In addition, I totally agree with you “Believe it or not, the most common and frustrating issue in using most of these retirement calculators is that the vast majority of them can’t handle early retirement! ” My wife and I are also aiming for an early retirement and this one has always been an issue with the online calculators. Thanks EFF, agreed. BTW, I just enjoyed a look at your blog — especially your Financial Rules! Thanks for the post, it’s very good, as always!. Since I also have a background in engineer, I really like the approach you give to your posts. My little contribution is that I would be very careful when using Monte Carlo methods in portfolio simulations, since they might not reflect the real behaviour of the markets, and I understand all the tools you presented follow that approach. The main problem boils down to succession of returns. In Monte Carlo simulations, they are random and might be detached from real market behaviour. I know there is a lot of uncertainty in portfolio simulations. However, I feel portfolio simulations against past historic market performances (like firecalc does) give a better approximation of future scenarios (yes, assuming history repeats itself). For some more insight into this, I would like to refer the readers to the book “Unveiling The Retirement Myth” from Jim C.Otar, since he explains it very well in his book (sorry, I am not an English native speaker). Anyway, he proposes a two-layer approach for running Monte-Carlo simulations to sort of overcome this problem. Maybe this could be implemented in the “Flexible Retirement Planner” as an improvement. I must say that apart from the Monte Carlo simulation detail, I really liked this tool. Specially the sensibility analysis part. Thanks Oriol. I agree with most all of your points. Note that Todd Tresidder at FinancialMentor also believes Monte Carlo is inappropriate for retirement simulations, and so his Ultimate Retirement Calculator does not use it for that reason. Jim Otar is an influence of mine, and I discuss his views on the limitations of Gaussian distributions in my article Why Most Retirement Calculators Don’t Work. As you note, one issue with FireCalc is whether past history will repeat. My own view now — in a nutshell and subject to change — is that all of these modeling approaches have their limitations, but most can deliver insights, as long as those limitations are kept in mind. Thanks again for the detailed comment! Yes, I just read the post you refer and I fully agree with the points you state in it. The 2-3% range seems very appropriate to me giving the current market valuations. Actually, that is my target: 2.5% SWR for a long early retirement. Thanks. I have a soft spot for FIRECalc, since it was the best probabilistic calculator in existence back in the late 1990s. (I think the choices back then were Financial Engines, which is now a paid membership, or FIRECalc, or T. Rowe Price’s paid software.) But maintaining FIRECalc’s code and updating the returns data has been a challenge for the current owner. None of the probability calculators succeed in persuading users that 80% is (“probably”) good enough– and I know many users who completely ignore a 99% to obsess on the 1%. These days I wonder what percentage of users actually successfully complete the data entry. I think Vanguard (and Fidelity and USAA) calculators probably do a better job for their customers just by simplifying that chore. They give the user a confidence boost to dig deeper and seek more tools. I’m still waiting for robust modeling of flexible spending, even if it’s just automatically reducing spending 5%-10% after the market returns are negative. Thanks Nords! All good points — appreciate it. Check out the spending policies in Flexible Retirement Planner, if you get a chance. Thanks for including my calculator in this excellent review. I’m honored! All of your criticisms were 100% accurate as well as your acknowledgements. Your solution regarding how to adjust average returns for volatility to give the user complete control over assumptions and modelling was also spot on. The thing I particularly liked about your entire approach was the premise – that this is an impossible task with no perfect solution. Every choice made in calculator design is a matter of tradeoffs. Well done! Thank you Todd. Honored on this side as well. And thanks for making your excellent calculator, and expertise, available to the world via FinancialMentor. Here’s another online calculator worth considering. I have found it very simple and useful. It really targets how much fees cost you. Thanks Ted, and thanks for the link. I’m glad some progress has been made on disclosure of retirement plan fees. The impact of high fees can be shocking. Thanks for giving us your insight regarding your favorite free Retirement Planning Calculators, which I’ll refer to as your “Final Three” or “Last Three In” since “March Madness” is upon us. In the spirit of Joe Lunardi’s “Bubble Teams” concept, I thought it would be interesting if you would be kind enough to share the names of your “Last Three or Four Out.” I’m not looking for the pros and cons of these calculators, just their identity. That would let inquisitive readers like me check out programs on your “Short List” that didn’t make the final cut for whatever reason. 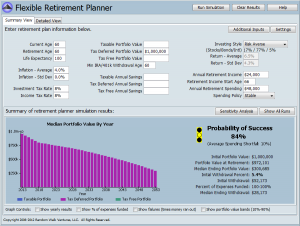 Also, I would be interested in any specific comments you might have about T. Rowe Price’s “Retirement Income Calculator.” I used it for the scenario you described; it was simple to use and produced a visually rich, easy to understand graphic conclusion that allows the user to make changes to his/her inputs and compare the results with the previous calculations. It requires the user to input a present value lump sum to handle Social Security benefits received subsequent to the initial retirement date, as does Vanguard’s calculator. One thing I find really nice about TRP’s RIC is that it allows you to easily and quickly adjust your projected expenses, income, asset allocation or life expectancy and immediately see how that change potentially impacts your retirement results. BTW, as a point of comparison TRP’s calculator suggests that if your hypothetical couple spends $4,000 a month they have an 85% chance that their savings will last until age 95. If this couple reduces their monthly spending by $290 (to $3,710/month), there is a 90% chance that their nest egg will persist until they reach age 95. The ability to compare possible outcomes by altering the asset allocation may be of particular interest to retirees who are somewhat risk averse. For example, the software indicates that if this couple reduces their monthly spending by $299 (to $3,701/month), they could utilize an asset allocation of 25% stocks, 50% bonds and 25% short-term (bonds, CD’s, money markets) and still have a 90% probability that their savings would endure until they were 95 years old. That conclusion, if correct, might be quite helpful for an investor who is especially intolerant of prospective stock market volatility. The results from TRP’s calculator seem closest to those provided by the Flexible Retirement Planner software. 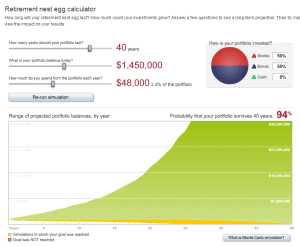 I also ran this scenario through American Funds’ Retirement Calculator. Their outcome implied that your hypothetical couple’s assets would successfully carry them through their anticipated 40 year retirement, with a remaining legacy of $961,221 for the couple’s beneficiaries at age 99. I appreciate the effort you put into this blog. It’s an excellent retirement planning resource. Please keep up the good work! Ritch, you’re welcome. And thanks for the detailed comments on these other calculators, plus their modeling results. You get the prize, so far, for follow-through! Your notes on the impact of potential changes to spending and asset allocation for success rates will be very helpful to other readers. For those interested, the other calculators on my “short list” were the offerings from E*Trade, Schwab, and T. Rowe Price. Any of these could be useful, in the right situation. T. Rowe Price is widely recommended and does have a very strong interface that makes it easy to compare scenarios. Thanks again for your thoughts and research Ritch! I don’t understand how “security issues”, a “rudimentary interface”, and a “hard to validate algorithm” would rule out a spreadsheet from a generous engineer. Security issues? What? Someone would hack the spreadsheet and cause the results to be in error? A rudimentary interface? I find the spreadsheet to continue every option that is in the Flexible Retirement Planner. A hard to validate algorithm? What does that mean? Are you not good at math? We both know who you are talking about here, and I find your dismissive tone to be outrageously out of place. The free spreadsheet gives results that are just as meaningful as those of the Retirement Planners you tout … plus since I can copy it to my PC I don’t have to risk the REAL security risk … java. Thanks! But no thanks. It’s tough to review retirement calculators without offending somebody. I’m sorry if I offended you. I reviewed at least 3 or 4 spreadsheets and was not singling anybody out in particular. Undoubtedly some of them could provide useful answers. But I’ve got several decades of commercial software development experience from which to make judgements, and I stated my criteria clearly. There are many, many retirement calculators available and I chose those I felt would be best for the majority of my readers to use. Other people are entitled to their opinions, and I’ve invited you all to include a link to your favorite calculator here along with the pros and cons. Great calculators, but I’m not sure whether I can use them in my situation. I’d like to retire within a few years while my spouse plans to retire in 9 or 10 years. Is there a calculator for this fairly common occurrence? Hi Sketch. Yes, it’s a bit trickier, but both the latter two calculators in my review can handle additional post-retirement income streams. This is just another example where the definition of “retirement” is slippery. In this case, it would be your retirement, but not your spouse’s. For modeling purposes, the “retirement” label is often arbitrary — we’re just analyzing future cash flows. P.S. My post How to Model the Retirement Income Gap should also give you some insights into this issue…. I think in general you’ll want to combine those values for you and your spouse, but there could still be some tricky issues. If you still aren’t certain, I’d suggest emailing Todd at FinancialMentor via his contact page. I imagine he’d be happy to help out. Will do. Thanks for the help. It’d be nice to have confidence that we won’t go broke before we reach the … ahem… finish line. Darrow is correct. You are really just mapping future cash flows so the distinction of your and your spouse is arbitrary. Just map the cash flows for both of you and the math will be accurate. If that isn’t clear enough just reach out to me and I will try to help. I have been looking for a retirement calculator to see how many more years it would take me before I can retire. Though I do not have any plan of retiring in the next 10 years, I believe knowing is the next best thing to do. I am very poor with computations that involve interests and percentage rates but you made me understand easily the pros and cons of these tools. Thanks for sharing. Thanks for dropping by Cherleen. Great stuff. Love your take on retirement planning/management and am a faithful reader. I have one question about Todd Tresidder’s calculator. Under Estimated Tax, he asks for an “estimated tax rate during retirement (%).” I’m not sure what to enter there. For example, as an individual taxpayer, if I estimate an annual income of $60,000, do I enter 25%, the stated marginal rate? Or do I work out the dollar amount ($5,937 + 25% of $23,750 = $10,928) which is 18% on the whole? Hi Gary, thanks for the comment — I appreciate that. Yes, you’re on the right track regarding the tax rate. It really needs to be your effective rate (total tax divided by income), not the marginal rate. 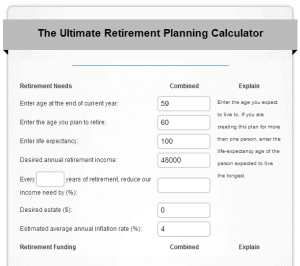 I reviewed the report from my run of the Ultimate Retirement Calculator to be sure. It’s going to multiply 1 minus that number by your Pre-tax Need to compute an Adjusted Need, so it’s an overall or effective rate. You can email Todd to be 100% certain but most retirement calculators work this way. Darrow is correct. It is your effective tax rate that matters – not the marginal rate. Wow. Great detail and article. However, all this makes me realize how glad I am that real estate is my retirement plan. I can create passive income through rental properties without having to worry if my nest egg runs out or I live too long. It seems like such a guessing game with traditional retirement plans. Thanks Mark. And I really do agree with you, mostly. I know a number of people who have done well investing in rental property. I definitely recommend that route, among others, and even wrote about it a bit in 3 Proven Investment Strategies. I wish I enjoyed houses and management more, because I do think it’s a profitable and proven route to financial security. But it just wasn’t my path. The only long-term downside I can see is that you really are running a business, and that might be too much in late retirement. Though you could hire a manager or sell out and buy annuities at that point, I guess. Anyway I appreciate your comments. Also, your own site looks excellent for those so inclined. Thanks for contributing! I came across the Vanguard calculator a while back and i really like it except I’m not sure if the outputs are accurate to my situation. Let me explain in more detail. I will be 53 next month and we currently have $774,000 split between a taxable account, rollover IRA , and a Roth account. I’m also eligible for a pension at 65 of about $1900/mo plus SS. We currently receive $22,500 in dividends which are reinvested. Our taxable account has balance is at $364,000, which would not produce enough income at a 4% withdrawal rate. If assume I need 25 times my living expenses then I need approximately 1.3M. I can’t touch my rollover IRA until 59 1/2 unless I do the 72T but that’s not an option given the low interest rate used to calculate withdrawals. So, how can I use one of financial calculators to determine when I can retire. Hi Mark, thanks for the detailed question. The timing of your scenario is similar to my own and it does make the calculation trickier because you have to rely on taxable assets at first, then IRAs plus a pension or Social Security later. You can’t implement a safe withdrawal rate of 4% on your taxable account: you’ll actually probably draw it down and possibly exhaust it first, then start relying on the other accounts later in retirement. There are two modeling approaches I can recommend: calculating present values to see if you have your 1.3M, or doing a cash flow analysis to see when you’d run out. The Vanguard calculator lends itself to the first analysis, while the Ultimate or Flexible calculators can handle the second. My article How to Model the Retirement Income Gap talks about how to do this in more detail. To give you some guidance, I’ve run your numbers through two of the calculators and will send you the results, along with a few more thoughts, in private email. Hope that helps. Just remember that I’m not an advisor, and there are key assumptions (like inflation, investment return, and tax rates) that must be made and checked. You’ll have to confirm those assumptions and make your own judgment on the retirement decision. Note, your comment brings up another interesting and related question, once you’ve decided you have enough to retire: How do you manage and sequence your withdrawals to optimize your retirement income? That’s a question that I’m continuing to study, and hope to write more about in the coming year…. Thanks again Mark, and good luck with your retirement decision! I appreciate the example you sent me. I think it makes sense to hold off a for now and continue reinvesting the dividends. A quick addendum to the email above. Was just on the iPad app, “RetirePlan” reworking my numbers. I love this app as it works for future retirees or current retirees. It asks about qualified and unqualified assets as well as future Pension (if any), Social Security and other major life events (live selling your house and downsizing, or putting children through college. It also asks you for your an input on tax, inflation and investment return rates. In essence, about twenty questions which can all be filled out in under 10 minutes. You then get a great bar graph showing your retirement balances in today’s dollars and “gross” retirement balances. If you have an iPad, you should really check this app out! Hi Fred. Thanks for the comments and, I agree, these both look like excellent calculators. I don’t have easy access to an iPad, so I didn’t evaluate them in depth, especially the actual modeling results for the scenario I proposed. But I found extensive screen shots of RetirePlan here, and I was able to exercise the SmartMoney Retirement Planner online here. In both cases, the programs look to be both comprehensive and very friendly. I would not say that the Ultimate or Flexible calculators from my article are missing variables though. Both of them offer extensive inputs for both one-time benefits and post-retirement income. Flexible Retirement Planner is particularly powerful in this respect (see the Additional Inputs button). These options can be used to model all of your listed parameters. Ultimately the purpose of my article wasn’t to pit calculators against each other but just to get the best tools on the table so we can compare results and pick and choose according to our needs. Again, your suggestions look very good, so I’m really glad you commented. Thanks! Have you plugged your data into http://futureadvisor.com? I was impressed at all the suggestions it had for me. Steven, thanks for the tip. That’s an impressive site with some great credentials and methodologies behind it. I see it as more of an investment advisory service, similar to Betterment, MarketRiders, or Wealthfront. I might do a review of these separate from retirement calculators at some point. It might be difficult to use them as general purpose retirement calculators, because some of the parameters are fixed and embedded in the individual account. I would encourage anybody who is interested in getting inexpensive, automated investing (and some retirement) advice to check these out….